In October, Zodiac Casino has got another 2 great new Microgaming games for you! 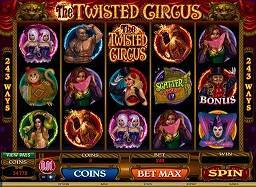 Try out Twisted Casino and Phantom Cash and participate in great promotions! How’s your September been? Time’s flying by as usual, and we can’t believe there’s less than 3 months until Christmas. A lot of us spent last month watching the sports in London and playing on the newly released 'Max Damage and the Alien Attack' game. It reminds us of those classic video games of the 1980s, except of course that you can win lots of money! In October, Zodiac Casino has got another 2 great new Microgaming games for you! Prepare to be dazzled and intrigued in the entertaining world of the Big Top with this 5 reel, 243 ways to win freak show of a game. You will find bearded ladies, fire eaters, strong men, snake charmers, musical monkeys and of course the Ringmaster. They all provide an amusing backdrop as you bet your way to a magnificent 37,000 jackpot in the base game or a 111,000 jackpot in free spins mode. Keep your eyes peeled for three of the Ringmaster symbols to get access to the Big Top and the Circus Match Bonus. Phantom Cash is a 5 reel, 25 payline Victorian ghost catcher themed slot, launched just in time for Halloween. Keeping with the popular steam punk trend, Phantom Cash follows two well-dressed ghost hunters as they rid the world of evil ghouls. Atmospheric soundtrack and spooky graphics will keep you on the edge of your seat, but don’t get too scared – the prizes are just around the corner for the brave. These great Microgaming games are now available at Zodiac Casino!